Larry Joe Taylor (LJT) Music Festival has once again come to Stephenville, Texas, along with the music, fun, and drinking dangers. 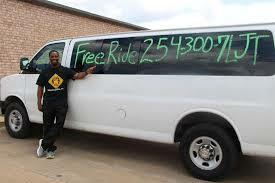 For rides from the “Jesus Bus,” students can call 254-300-7LJT. Photo courtesy of the Stephenville Empire- Tribune. The number of DUI and DWI’s arrests increase during the festival. To help decrease numbers of DUI’s and DWI’s, and avoid accidents, many shuttle services have offered to help students and festival attendees get back to their residences safely. One shuttle service that will be offered during the LJT Music Festival is from The Cornerstone Assembly of God’s “Jesus Crew” Ministry. They are a group of 30 people led by Donnie Hill, driving 15 buses taking people to and from the LJT festival. The service is free of charge but they do accept donations and tips. All donation money will be contributed towards Tarleton State Christian Ministry, and whatever is left will go to a fund for next year’s shuttle service. To leave a donation, you can contact Hill by calling 254-952-7931. Buses will run from 12am to 1am on Wednesday and Thursday, then they will continue their services by running the buses from 12am on Friday to 6am on Sunday. Students can schedule rides by calling 254-300-7LJT, students will be picked up and dropped off at the parking lot of the LJT festival. This is Hill’s 15th year leading the Jesus convoy. The focus of it is to save the lives of those attending the festival as well as the lives of Stephenville citizens and making our streets as safe as possible for all.